Matthew Glaetzer (South Australia) wrote his name in to the history books with his keirin title, as he swept the sprint events claiming four gold from four events. Patrick Constable (South Australia) made up for sprint disappointment claiming silver and Thomas Clarke (South Australia) picked up medal number three of the week with bronze. The women's keirin was taken out by Stephanie Morton (South Australia) who claimed her third national title of the week and fourth medal in a crash impacted race that saw Caitlin Ward (Victoria) fall heavily on the final lap. Kaarle McCulloch (South Australia) and Rikki Belder (South Australia) found the podium in silver and bronze. Amy Cure (Tasmania) completed the double double winning the women's scratch race to add to her point race gold, defending her titles from a year ago. Silver went to teammate Georgia Baker with Queensland's Kristina Clonan completing the podium. 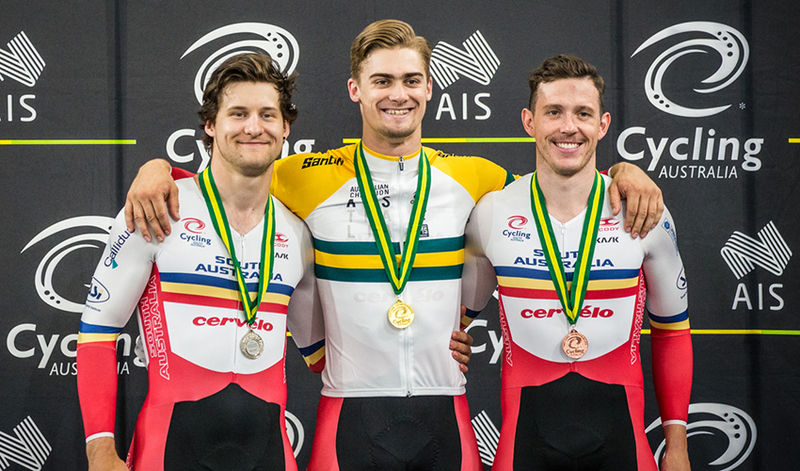 Kelland O'Brien (Victoria), Joshua Harrison (South Australia) and Stephen Hall (Western Australia) turned the men's points race in to a demonstration event with the trio dominating the race to fill the podium lead by O'Brien ahead of scratch race champion Harrison and Hall. Sarah Gigante (Victoria) grabbed a remarkable sixth national title with the under 19 women's points race title in a dramatic finish. Thomas Cornish (New South Wales) won the under 19 men's 1km time trial, Victoria's Luke Plapp and Nathan Bof grabbed the under 19 men's Madison, Alana Field (Victoria) the under 19 women's sprint and Luke Plapp the under 19 men's scratch race. Glaetzer completed a perfect week as he raced clear of the field to pick up gold number four sweeping the sprint events. The final lap saw his brutal acceleration distance the field with time to look behind him before hitting the line. Constable and Clarke made it an all South Australian podium with silver and bronze. Morton claimed her fourth career keirin national title in a dramatic race with a crash on the final lap sending Caitlin Ward down the track and to hospital. The powerful Morton leapt to the front for the opening lap and powered home for her third gold and fourth medal of week. McCulloch took silver, also her fourth medal of the week with Belder completing the podium. Team pursuit world champion O'Brien proved his versatility to take a lap a third of the way in to the 160-lap race with Harrison and Hall. From this point the event quickly became a race of three with the trio duking it out in the sprints trying to gain the upper hand. With O'Brien edging in front all he had to do was closely mark Harrison, his closest rival with the duo rarely separated by more than a few metres for the final 70 laps. Fighting all the way to the end Harrison pushed O'Brien to the line but the speed of the Victorian proved too much to overcome in the sprints. Cure again showed her bunch race class as she stormed home to narrowly claim the women's scratch crown with silver and bronze medallists Baker and Clonan going three wide on the line, with little splitting the three. Attacks came early with South Australia often part of the action and as with the points race on Saturday it was Alex Manly front and centre with the 21-year-old going clear with just after the half way point. Knowing the danger Manly posed Clonan and Cure were quickly on the chase with Ashlee Ankudinoff (New South Wales) and Baker soon joining them creating a five rider move. The race was all back together as the pace lifting heading in to two to go with Georgia Baker leading it out, with only Cure's lunge for the line pipping her with Clonan marginally further behind. Gigante claimed national title number six of 2018 as she made a long solo attack in the final 30 laps to take the title on 25 points ahead of Alex Martin-Wallace (Queensland) on 20 and Olivia Wheeler (South Australia-16). The opening two sprints were taken out by a flying Martin-Wallace who's turn of speed put her in the box seat and at the half way point it looked like she was riding away with it. A crash inside 15 laps to go saw the Queenslander go down and by the time she was back up the strength of Gigante had established a lead of more than half a lap. Feeling the impact of the crash a shaken Martin-Wallace was unable to reduce the gap with Gigante riding away to gold. A move by Martin-Wallace on the final lap saw her seal silver, her sixth medal of the championships. A lap taken by Plapp and Bof earned them victory in the under 19 men's Madison on 56 points. The daring move by the pair mid race caught the field unaware as they quick raced away to the lap and 20 points that come with it jumping them to the lead before finishing on 56 points. The face pace saw the field whittled down to just five teams by the end of the race. Thomas Lynch and Daniel Gandy (New South Wales-44) and Jensen Plowright and Bill Simpson (Victoria) completed the podium. Having broken his own Australian Record in qualifying with a time of 1min 1.835secs there was no stopping Cornish in the final as he covered the four laps of the track in 1min 2.052secs, nearly a second and a half faster than silver medallist Matthew Rice (ACT-1:03.395) and Graeme Frislie (Victoria-1:04.537). Field repeated the 2014 performance of her sister Courtney to claim the under 19 women's sprint crowd. Having set the fastest time in qualifying of 11.631secs, she was too strong for Hannah Sandison (New South Wales) and Martin-Wallace to book her spot in the ride for gold. Field's speed was too much for team sprint and time trial champion Vonderwall with the Victorian taking it in two rides. The battle for bronze went to Heather May (South Australia) who took the medal in two rides over a tiring Martin-Wallace who was competing in her seventh event of the week. A late attack by Plapp delivered the Victorian a near lap lead and time to celebrate as he crossed the line arms in the air to a massive roar from the crowd. In similar fashion to the other under 19 events the pace was on from the start with Queensland's Blake Quick and James Moriarty frequently on the move much to the delight of the home crowd. The face past sapped the bunch of legs to chase a brave solo move by Plapp inside the final 15 laps, as despite interest from behind nobody could match his speed. The podium was completed by New South Wales duo of Daniel Gandy and Zachary Marshall.